Despite concerns about media independence and credibility in some countries, this study finds adults in the Arab countries surveyed are generally trusting of news media. Respondents believe the news media strive to report news fairly and accurately. Overall, nearly seven in ten say they have trust and confidence in mass media to report the news fully, accurately and fairly (69%). Nearly all nationals in the UAE express trust in mass media (91%); those in Lebanon are more skeptical than others but still generally trusting (53%). Overall trust and confidence in media correlates to perceptions of news media in each country. Adults who believe media in their country are credible have more trust in mass media (82% vs. 45% of those who don’t think their media are credible). Similarly, those who feel their national media can report the news independently without interference from officials also have more trust and confidence in the accuracy and objectivity of the mass media (78% vs. 52% who don’t think their media are independent). As depicted in the chart below, adults who pay more attention to news are more likely to express confidence in the general quality of news media. Most adults desire comprehensive reporting from the news media, reporting both positive and negative aspects of society. Two in three believe it is OK for news organizations to report about problems in society (66%), a sentiment expressed by majorities in all countries. Those who follow the news closely are more likely to say it is OK to report about problems in society than those who don’t (81% vs. 51%). Opinions about the quality of national news media vary widely among countries surveyed. Nationals from the Gulf states (UAE, Saudi Arabia and Qatar) tend to have a more positive opinion of their media; the majority say the news media in their country are credible. In contrast, those in Egypt, Lebanon, and Tunisia express less confidence in their national media, with fewer than half agreeing that news media in their country are credible. Older individuals have more trust in the credibility of media than their younger compatriots. This difference, perhaps, is related to a greater level of interest in news. Nationals in most countries perceive national media to be more credible in 2015 than in 2013. 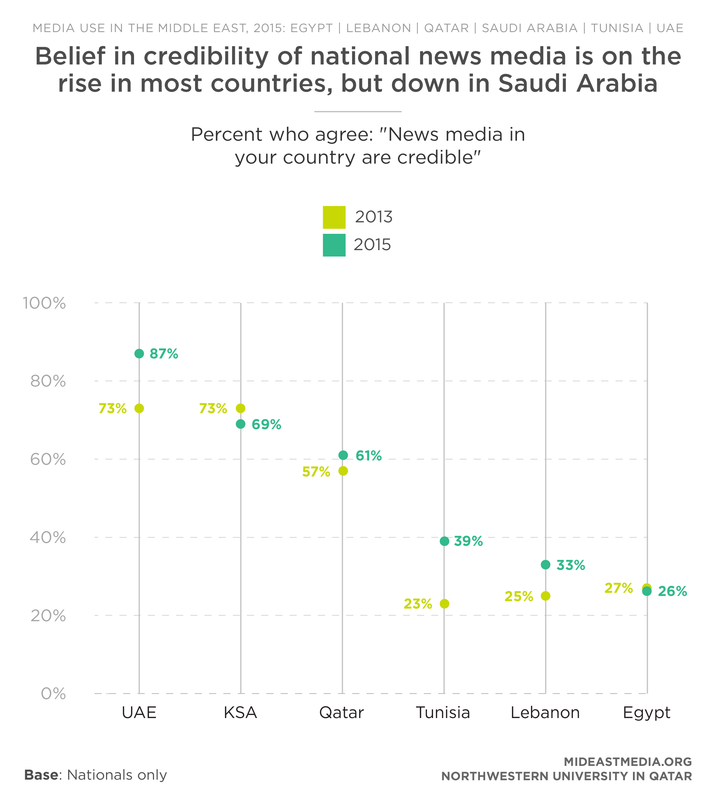 There are two notable exceptions to this finding: perceptions of media credibility remained low in Egypt and declined in Saudi Arabia. As with credibility, perceptions of media independence also vary across countries. Nationals in the Gulf states tend to believe media in their country can report news independently without interference from officials (72%, 57%, and 57% respectively in UAE, Saudi Arabia, and Qatar). Those in Egypt, Lebanon, and Tunisia, on the other hand, express more concern about government interference in news reporting. Less than half of Nationals in these three countries feel news media can report the news independently (25%, 33%, and 46% respectively). In fact, about one in three disagrees that news media can report independently (34%, 33%, and 31% respectively). Perceptions of independence have increased slightly since 2013, though Egypt and Saudi Arabia nationals are again exceptions. Belief in media independence remains low in Egypt (27% in 2013 vs. 25% in 2015) and declines in Saudi Arabia (68% in 2013 vs. 57% in 2015). Independence and credibility are related: nationals who believe news media in their country can report without interference from officials are much more likely to find news media credible (74%, vs. 16% for those who don’t believe news media are independent). Regardless of overall perceptions of national news media, a sizeable majority of nationals still rely on national media for their news. Seven in ten say their favorite news organization is based in their own country. Nationals in Saudi Arabia, however, are an exception; about half say their favorite news organization is based in an Arab country other than Saudi Arabia (51%). 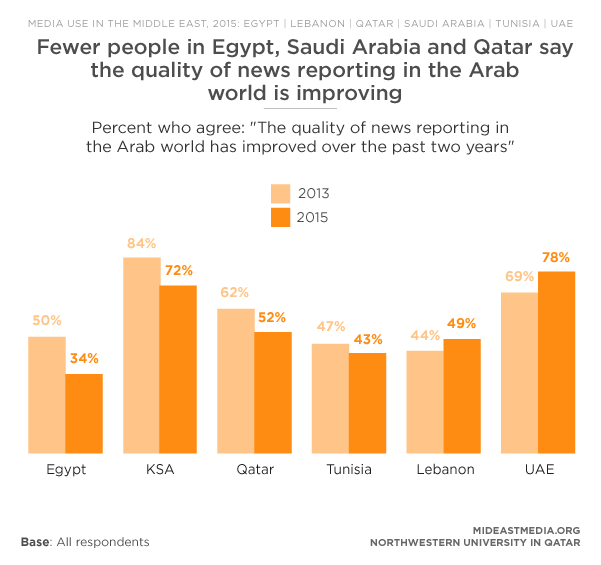 Perceptions of the quality of news reporting in the Arab world vary considerably. Most nationals in the UAE and Saudi Arabia feel the quality of news reporting in the Arab world has improved over the past two years, a finding consistent with more positive opinions of their own news media. Comparatively, a third of Egyptians surveyed feel regional news quality has improved, a sharp decline since 2013. There has been a decline in perceptions that the quality of news reporting in the Arab world has improved in four of the six surveyed countries. Six in ten nationals surveyed follow news in their country closely, with 43% following regional and 34% following international news closely. Saudis are the most likely to follow regional and international news closely (62% and 50%, respectively), while Egyptians show less interest (27% and 16%, respectively). More men are interested in regional and global news than women, while adults under 25 express less interest in news generally. Those who travel outside the Middle East are more interested in international news (50%, vs. 31% of those who do not travel outside the region). About half of nationals feel there is a benefit from consuming news from foreign news organizations, while one in five Egyptians agree. Those who travel outside the region are more likely to find news from foreign outlets beneficial (61%, vs. 40% of those who do not travel outside of the region). This survey asked respondents whether they agreed with the statement that “people benefit from consuming news from foreign news organization.” In the 2014 study Entertainment Media Use in the Middle East, respondents were asked a similar question: whether they agreed with the statement that “people benefit from consuming entertainment content from different parts of the world.” By comparison, it appears that significantly more people in the region embrace foreign entertainment than foreign news. Seven in ten say their favorite news organization is based in their own country. Nationals in Saudi Arabia, however, are an exception; about half say their favorite news organization is based in an Arab country other than Saudi Arabia (51%). Many nationals prefer government-owned news outlets to private news organizations, particularly in the UAE. Lebanese and Saudis prefer privately-owned news outlets.